Who had the brilliant idea of kicking games off at 6pm? There are three days in a weekend, and we’ve even seen games moved to Thursday as well, so why do the PRO12 decide that some games need to start at such an awkward time on a Friday night? I understand it’s so it doesn’t clash with the World Cup Bronze Final, but the fact of the matter is it’s a nightmare for those who have to travel a considerable distance to games (especially for our hosts Munster) and it results in reduced attendances and viewing figures. Thomond Park hasn’t exactly been a hive of activity this season as far as attendances go, as has been the case for the past few seasons, and it’s likely that the 6pm kick-off will negatively affect them even further tomorrow night. Spare a thought for those making the trip from Cork and Waterford up to Limerick for the game, and for those on the eight hour round trip on the supporters’ bus! Our opponents had hit a rich vein of form up until last week when they were brought back to earth with a thump by the Scarlets. Four straight wins against Treviso, Ospreys, Glasgow and Cardiff constituted a very impressive start to the season and had them unbeaten and top of the league before an 82nd minute Steven Shingler penalty ended that 100% record at the Parc y Scarlets. Back in front of their home fans and determined to rectify last week’s reverse, they will be a dangerous beast. On the contrary, our last game saw us notch up another bonus point win at home even if it wasn’t wholly convincing, and it means we have now registered 15 from a possible 15 points at home. That said, our away difficulties are well documented and with our games in Llanelli and Edinburgh still fresh in the minds, Limerick is the last place we probably want to go right now. Much like last week, the stats all point to a home win. This game is going to be extremely tough – we know how hard it is to go and win at Thomond Park with its feared reputation. In fact, Munster haven’t lost in Limerick in their last 11 matches at Thomond with the last victors being Clermont Auvergne back in the Champions’ Cup last December, while their last home loss in the league came last September to the Ospreys. Meanwhile, our last seven games have all been won by the home side on the day and we haven’t won an away match since April when we defeated Connacht at the Galway Sportsground. And let’s not forget that Munster were the only side we never actually recorded a victory against last season after we lost to them at this venue last November and then drew with them at the Kingspan Stadium back in May. And as if that wasn’t enough, we’ve only won once at Thomond Park in the PRO12 since 2009: when a much-changed team stole four points in a 19-17 win in May 2014. Interpros always have that extra edge to them and this game should be no different. Expect big hits, a close tie and Nick Williams battering a few of his old team-mates here and there! And perhaps if we can finally banish our away hex then a very important and morale-boosting victory could be on the cards. Six changes for Axel Foley and Munster from the team that lost to the Scarlets last Friday. Simon Zebo is recalled onto the wing having returned from international duty while Francis Saili is recalled to the starting line-up at outside centre having missed last week’s game. Tomas O’Leary is preferred to Cathal Sheridan at scrum-half as the third change in the backs. Up front James Cronin replaces Dave Kilcoyne at loosehead prop while Mike Sherry comes straight back into the starting line-up having been rested in Llanelli. Jack O’Donoghue comes back into the side at openside flanker, while the final change results in a major reshuffle of the pack as Dave Foley returns to the second row with Robin Copeland shifting to number eight, CJ Stander moving to blindside flanker and Dave O’Callaghan dropping out altogether. World Cup returnees Mario Sagario and Donnacha Ryan are named on the bench. Neil Doak has made four changes to the side that defeated Cardiff last weekend, with both Paddy Jackson and Darren Cave returning to the starting line-up. Jackson replaces Ian Humphreys at fly-half while Cave comes in at outside centre in place of Sammy Arnold, with both replaced players dropping to the bench. There is one other change in the backs with Peter Nelson replacing Louis Ludik at full-back, while the only change to the forwards sees Andrew Warwick replace Callum Black at loosehead. Ireland international Chris Henry is named among the replacements. 15. Andrew Conway, 14. Simon Zebo, 13. Francis Saili, 12. Denis Hurley, 11. Gerhard van den Heever, 10. Ian Keatley, 9. Tomas O’Leary; 1. James Cronin, 2. Mike Sherry, 3. BJ Botha, 4. Dave Foley, 5. Mark Chisholm, 6. 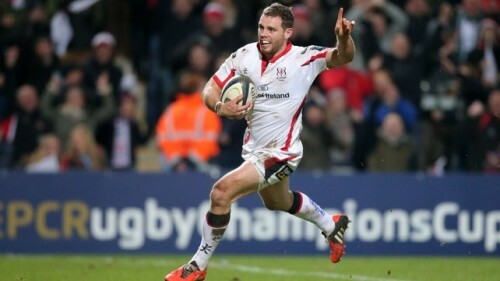 CJ Stander (capt. ), 7. Jack O’Donoghue, 8. Robin Copeland. Substitutes: 16. Duncan Casey, 17. John Ryan, 18. Mario Sagario, 19. Donnacha Ryan, 20. Jordan Coghlan, 21. Duncan Williams, 22. Rory Scannell, 23. Ronan O’Mahony. 15. Peter Nelson, 14. Craig Gilroy, 13. Darren Cave, 12. Stuart McCloskey, 11. Andrew Trimble, 10. Paddy Jackson, 9. Paul Marshall; 1. Andrew Warwick, 2. Rob Herring (capt. ), 3. Wiehahn Herbst, 4. Lewis Stevenson, 5. Franco van der Merwe, 6. Roger Wilson, 7. Sean Reidy, 8. Nick Williams. Substitutes: 16. John Andrew, 17. Callum Black, 18. Ricky Lutton, 19. Dan Tuohy, 20. Chris Henry, 21. Paul Rowley, 22. Ian Humphreys, 23. Sammy Arnold.